The phrase, “Waste not, want not”, is one I remember my Mom saying when I was a child. It’s still one that resonates with me today. Don’t get me wrong, my Mom didn’t make us clean our plates, but she did teach us to not get out more than we intended to eat. Because that would be wasteful. We were on a tight budget for a period of my childhood, so my Mom also relied on leftovers to feed us. She would get two to three meals out of one meal and save money. Her motivation at the time was born out of frugality, but it taught me an even more valuable lesson — not to be wasteful. We fill up our landfills with so much garbage as it is, so I try to do my own little part by not contributing to that problem when I can. I try to buy fruits and vegetables grown locally if possible, and only buy what I’ll use over a 3-4 day period. It’s so easy to let fruits and veggies go bad if you get too much. Cereal is something I always have in my pantry. Sometimes there will be just a little left at the bottom of the box, though. What to do with that cereal at the bottom of the box? All the more reason I love the “Bottom of the box recipes” from Kellogg’s! 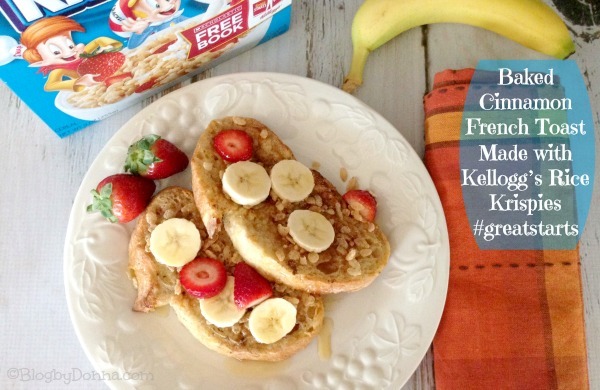 I recently tried the Baked Cinnamon French Toast made with Kellogg’s Rice Krispies from Kellogg’s.com…. 1. In shallow dish stir together eggs, milk, 1 tablespoon of the sugar, vanilla and 1/2 teaspoon of the cinnamon. Dip bread slices into egg mixture, turning to generously coat both sides. Place on 15 x 10 x 1-inch baking pan coated with cooking spray. 2. Bake at 450° F about 11 minutes or until light brown. 3. Meanwhile, in small bowl stir together remaining 1 tablespoon sugar and remaining 1/4 teaspoon cinnamon. 4. Turn bread slices. Sprinkle with KELLOGG’S RICE KRISPIES cereal. Lightly press cereal into bread. Sprinkle sugar-cinnamon mixture over cereal. Bake at 450° F about 5 minutes more or until light brown. 5. Top each slice with some banana slices. Serve with syrup. My family loved this french toast and Baked Cinnamon French Toast Made with Kellogg’s Rice Krispies has become our regular Sunday breakfast from now on. At least this is what my husband says. He said it was the best french toast I’ve ever made. They do sound delicious, don’t they? I love pork chops so those Oven-Crisped Pork Chops are calling my name. I’m sure you’ll find a great Bottom of the Box recipe to try yourself. Kellogg’s® believes that From Great Starts Come Great Things®. So we’re helping Moms start every day with a tip from the top athletes of Team Kellogg’s™ and Team USA dietitians. The thirty days leading up to the Sochi 2014 Olympic Winter Games will each feature fun pieces of advice to help families fuel just like the athletes of Team Kellogg’s. To see all 30 tips, visit Kelloggs.com/GreatStartsTips. 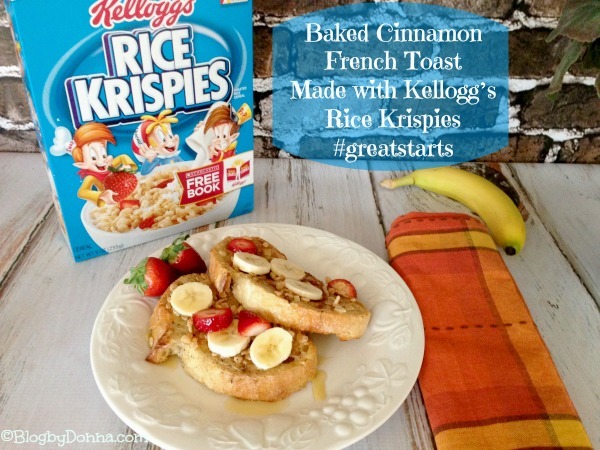 Be sure to check out Kelloggs.com/GreatStartsTips for more Great Starts Tips! What bottom of the box recipe would you like to try? This looks amazing! I bet that the Rice Krispies add an amazing crunch-factor to your french toast! It does add a nice texture to the french toast. My husband said it made it even more hearty tasting. Ohhh YUM! Those look so good! I have some “bottom of the box” mini wheats right now… so I’m going to check out that soup! Yum! I need to try this. So often we have enough at the bottom of the box for a recipe but not a whole bowl of cereal for breakfast. Love it! OMG yes this is a great idea!!!!!!!! and now im hungry for bananas and cereal thanks to your pics lol! Wow, Donna, now that is a cool looking breakfast! This recipe looks wicked yummy! This looks yummy. Thanks for sharing this Donna! This is really creative. I never think beyond Rice Krispies treats. That French Toast looks DELICIOUS! what a great idea and recipe. i would have never thought of this. I can honestly stay this will be my first ‘bottom of the box’ recipe I add to my stash – nice! I need to make more bottom of the box recipes. This looks so tasty. Thanks! I pinned this one. Sounds really yummy! What a fun idea. I have never thought to add rice krispies to the mix. That is SUCH a great idea! We always seem to have an awkward amount left at the bottom of the box so this is perfect! this looks like an amazing treat, simple yet so delicious. Oh yum, that’s a creative twist on french toast! What a creative way to get those last little bits of cereal from the bottom of the box, AND add extra crunch to your french toast. This is something I know my 8 year old would love to make . . . this weekend! We love to find new ways to make breakfast more fun. This looks like a great breakfast to change up what we do! I’ve used granola on my french toast, I’ll have to try it this way next time! I love how this adds some crunch. It looks yummy! And I bet it adds just a bit of crunch to the French bread. Yummy yummy yummy! I want. What a perfect way to use it up. I LOVE this idea so much, and now I want to go check my Rice Krispies and see if they’re empty enough to go ahead with it. My daughter just walked up to my computer and (somewhat upset) asked “When did you make THAT?” I had to explain that I didn’t. I was reading it. But she now wants me to make it. I bet I could to it with the regular bread I have because I think that’s the only thing I’m missing from the recipe! 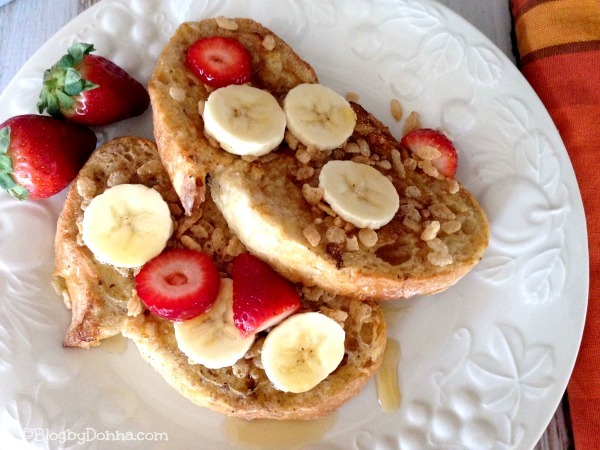 This looks fresh and delicious, great option for snack or breakfast! Oh this looks good! French toast is one of my favorite breaksfasts. I have never thought of using cereal for french toast. IT sounds so yummy. I love Kellogg’s Corn Flakes. This toasts seem so delicious! Yum! This looks fantastic for breakfast. Oh wow, that looks delicious! We cook french toast around here all the time but I love those upgrades! 🙂 Yummy! My! My! My! That looks so delish! This looks absolutely delicious. My kids would love the Rice Krispies addition! YUM! I’m sure the Rice Krispies give it such an amazing added crunch. Come to think of it, it’s been far too long since I last had homemade Rice Krispies treats! Oh I checked out the different recipes they have an found the Chocolate Bran Waffles – that’s likely the only way I’d get my family to eat bran! The vegetable soup sounds delicious! Dang this looks so good. I think I will get Rice Krispies just for this! Thank you!!! I NEVER LOOKED BEING ALONE I FINISH THE WHOLE BAG BECAUSE I ONLY LIKE FROSTED FLAKES SO THERE IS ALWAYS ANOTHER BOX BEHIND THE NEXT. MY PARENTS WENT THRU THE DEPRESSION SO I KNOW WHAT U MEAN. This looks so great! Sometimes those bottom of box recipes are the best. That looks amazing! I know my boys sure would love to have it for breakfast! What a great idea to add it to french toast. Yum! What a great idea! My kids would love this! Love the idea! I’ve never thought of adding rice krispies to the mix. Thanks! Yes, please! I bet this tastes just extraordinary! Thanks for sharing this recipe. This looks super yummy. I bet the Rice Krispies would add a wonderful crunch. This will be our Sunday brunch thanks!